Calling all kids (and their grown-ups) with big imaginations! Admission to LEGOLAND® Discovery Center Westchester grants you and your family access to an entertaining day of LEGO® -building fun in Yonkers. Watch a LEGO movie at the 4D Cinema, or see New York City at Miniland. Challenge your friends on the racetrack at LEGO Racers, construct cities from LEGO bricks or enjoy playtime at DUPLO® Village. Adventuresome kids can hop aboard Merlin’s Apprentice and Kingdom Quest Laser Ride. 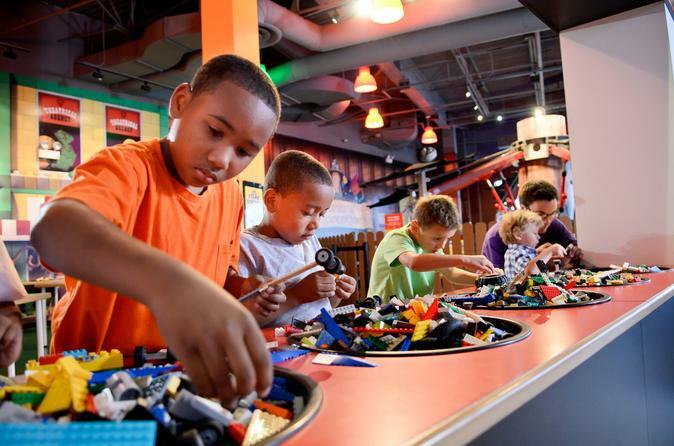 Located at Ridge Hill in Yonkers, New York, LEGOLAND Discovery Center Westchester is ideal for children ages 3 to 10. With 15 different attractions included with each admission ticket, families can enjoy plenty of entertainment. A typical visit takes two to three hours, but you can stay as long as you like. On a LEGO Factory tour, push buttons and spin wheels to help Professor Brick-a-Brack create new LEGO bricks. See a miniature version of New York’s famous skyline at Miniland, made from nearly 1.5 million bricks, or choose from thousands of bricks at LEGO Racers to build the fastest vehicle you can and race it down the test track. At the Earthquake Tables, you can construct a tall tower with as many bricks as possible, and then test the strength of your building. Younger fans will find double-size DUPLO bricks and large soft bricks at the animal-themed DUPLO Village, designed for parents and children to enjoy building together. Fight fires and enjoy the jungle gym or climbing wall at the LEGO Fire Academy and LEGO Construction Site play zones, which are great for beginner LEGO-lovers. Who will be the most noble knight with the highest score on the Kingdom Quest Laser Ride? Hop on a mighty chariot and challenge your friends as you zap hiding trolls and skeletons. Or, enter the potion room and pedal a bike as fast as you can to find spells and sorcery on Merlin’s Apprentice Ride. Join LEGO Friends with your own LEGO microphone, and perform on a karaoke stage in Heartlake City. Kids can also learn building tips and tricks by attending a class in the Master Builder Academy, where expert instructors take them through a Minibuild. For an additional fee you can keep what you build! Watch cinematic heroes and special effects at the 4D Cinema where 15-minute movies play throughout the day. Or head to the cafe for sandwiches and snacks (own expense), and stop by the gift shop on your way out for that perfect LEGO souvenir. Please note: LEGOLAND Discovery Center Westchester is a children's attraction; to promote a safe and family-friendly environment, adults cannot enter without being accompanied by a child.